I was inspired to make this card by a card I saw at a blog, made by a stamper named Leslie Miller. For the card, I used basic white cardstock that I buy at Walmart. The "green" layer, "tiny border flowers" and "scalloped circle" is Bazzill. The patterned paper is "Violet Parlor Paisley - scrapbook walls" by Chatterbox. The gingham ribbon is by "Basic Basic" that is made for Michaels. 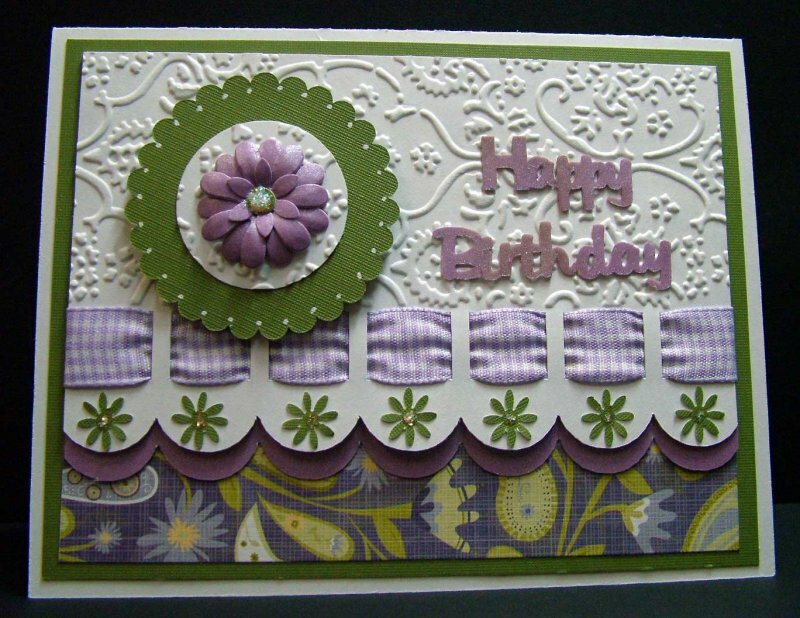 The lavender paper that I used for the border extension, large flower and "Happy Birthday" is "Pearlescent Cardstock" by Colorbok. I used Glittler Glue and Crystal Stickles for the flower centers. I made the "white dots" around the scalloped circle using my white "Gelly Roll Med." pen by Sakura. The embossing was done using my Cuttlebug and the "Textile" embossing folder. The "Happy Birthday" file was designed by Shirley Anne Young, at UK Scrapbooking site. I cut the scalloped section of the card using my CraftRobo and a file that I made and I also cut the scalloped circle with my Robo and a file that I made. Also, the tiny flowers were punched using my FISKARS "Flowers" corner punch and the large flower was made using my Sizzix Paddle Punch with the "Daisy" punch and the little flower in the center was punched using my EK Success Daisy Punch! Wow girl, that is gorgeous! Absolutely beautiful! Love the color combination, and the layering. Easy to see a lot of work and care went into this card! All of my favorite colors together - beautiful. Oh, I love that card! That is awesome! You did a wonderful job. I would feel so special getting that from MIL on my birthday! PROPS TO YOU for a wonderful job! day after day is exhausting! Love this card!! You did a wonderful job ... I also love you giving directions... Now I just need some time.